The Keysight N1911A is available to buy refurbished used or rent, usually from our UK stock. Click here to download the Keysight N1911A datasheet. Agilent P-Series power meters and sensors deliver the wide bandwidth and high performance measurements that you need to be confident your products are meeting their power specifications. The P-Series power meters have a 30 MHz video bandwidth and 100 M-sample/s continuous sample rate for fast, accurate, and repeatable power measurements. When these meters are used with the P-Series wideband power sensors, they provide up to 40 GHz frequency coverage, wide dynamic range, and extensive measurement capability that has been optimized for aerospace/defense, wireless communication, and wireless networking (IEEE 802.11a/b/g) applications. When you choose the P-Series power meters and sensors, you get best-in-class pulse analysis and peak power measurement specifications. A high-performance, 14-bit, 100 M-sample/s measurement engine drives the P-Series power meters, so you can capture single-shot as well as repetitive events over a wide bandwidth. For applications such as radar testing that require accurate pulse measurements, the power meter and sensor combination has = 13 ns warranted rise and fall time performance. With up to 30 MHz of video bandwidth, the P-Series gives you a single-instrument solution for testing wide bandwidth products such as the multi-carrier power amplifiers used in the newest wireless base stations. Bandwidth flatness is corrected to 0.1 dB over the 30 MHz bandwidth for highly accurate peak power measurements. The P-Series power meters and sensors offer comprehensive measurements that satisfy the requirements of many power applications in R+D and manufacturing. Peak power, average power, and peak-to-average ratio power measurements. Time-gated and free-run measurement modes. Automatic rise time, fall time, pulse width, time to positive occurrence, and time to negative occurrence time measurements. Complementary cumulative distribution function (CCDF) statistics. 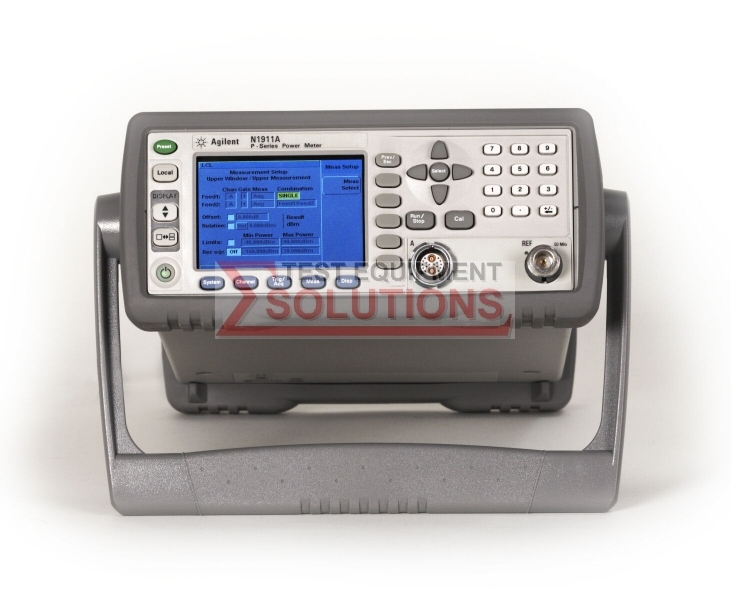 We offer the refurbished used Keysight (Agilent) N1911A P-Series Single Channel Power Meter for sale and rental. The Keysight N1911A is fully tested and refurbished in our in-house ISO9001 calibration laboratory. We supply manuals, accessories, full warranty and a free-of-charge Certificate of Conformity. We can also provide the Keysight N1911A with a fresh calibration for a small additional charge. If you have under-utilised test equipment talk to us about trading-in or part-exchanging it towards the Keysight N1911A or other refurbished test equipment.